Koreans have started playing mobile multiplayer games, and they may never play alone again. "Single-player games are a waste of devices built for human communication." That's how I summed up my feelings about the state of mobile phone games a year ago. What's the use of playing Solitaire on a networked, always-on device? There's so much rich potential for play between friends with mobile phones. I tremble when I imagine always-on play using my buddy list and maybe my location. When I visited Seoul recently, I discovered that it may finally be time to stop waiting and start playing. 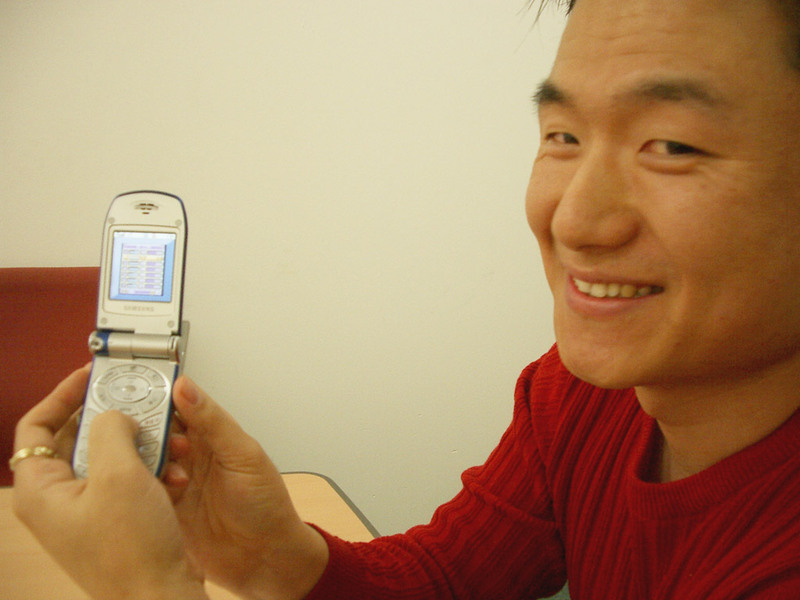 In October 2002, I explained that Korea was likely to be the home for mobile multiplayer. Seoul is the world's gaming capital, where someone with a solid hand in the PC game Starcraft can expect to make over $100,000 a year in tournaments and sponsorship. Tens of thousands of cybercafes still host teenagers exploring virtual worlds with their friends into the wee hours. And that's after the trend has waned - many more people are gaming from home now, since Korea leads the world in broadband penetration (over 60% homes were high-speed ready last year). In short, Korea is the epicenter for online gaming. South Koreans are a people prepared for play over networks. The last time I was in Seoul, online gaming companies like Nexon were touting their gaming portals. Think of these sites as something between Yahoo and Friendster, organized around trivia and parlor games. Players create an account, exchange a few won for game tokens, and then spend those tokens playing games, wagering on the outcome, or buying accessories for their custom avatar. This is a huge growth industry in the Korean games industry - simple, web-based 2D games in a personalized environment are attracting kids under 15 as well as middle aged folks eager for online social activity. Against this backdrop of active broadband internet play, Korea's has one of the world's most advanced mobile networks as well. They were one of the first countries to get 3G. When I was in Seoul last fall, I saw people watching live television on high-speed handsets. It was only a matter of time before the online multiplayer gaming appeared on Korea's mobile networks. Searching for the future, I found the Korea Game Development & Promotion Institute, a government body charged with research and promotion for the Korean games industry. The KGDI occupies a few floors of a high rise building that arcs up over the TechnoMart, a dense mall packed with geek goods home appliances. SB Han, in the Global Marketing division of the KGDI gave me a tour - the game library, the motion capture studio, the recording facility - top of the line equipment for rent by game makers. And in the floors above the meeting room where we poured over white papers, there were offices stuffed with game development startups. EZnego was one of the more senior companies there, with over thirty employees. They're focused largely on the mobile multiplayer business. I asked Andy Kim, EZnego's Global Marketing Manager, if they were using short mail or SMS for any advanced multiplayer games. 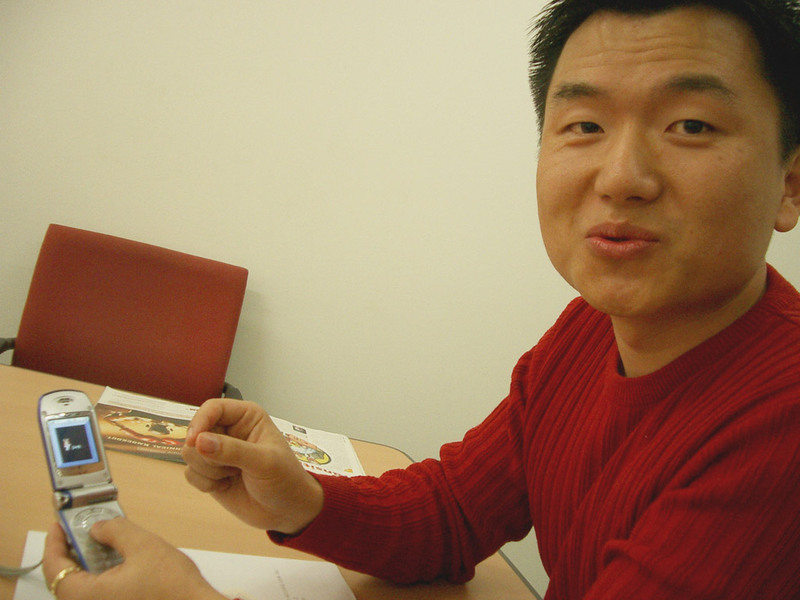 His reply astounded me: "Korean gaming is too ephemeral, too exciting for play-by-mail." So what kind of networked multiplayer games did they have instead? "Drop in, find someone, and play a hand of multiplayer poker with fake cash and a custom avatar within 30 seconds of the game booting up." Looking back over my notes from this meeting in October 2003, I couldn't believe all that he'd said. Maybe through a soju hangover, a haze of cigarette smoke and jetlag, I'd dreamed this up. It sounded too far evolved past anything else I'd heard about online play, anywhere else in Japan or the West. I called Korea this week for confirmation. Andy Kim explained that they have parlor games for play by two to four people. People can play with a random pickup, or they can make a private room and invite their friends, text-chatting as they go. Currently, EZnego's Zenio game service has a few avatars people can choose from, and soon they'll offer a wider range of avatars and customizable clothing and accessories to make your in-game character represent you better. SB Han took me to meet EZnego because they were an early mobile multiplayer innovator. Now other Korean game developers are joining the party. EZnego's Kim expects to see a wide range of multiplayer board games, parlor games, sports and racing games emerge for phones in the next year. "Last year most mobile companies made single player games. But from this year they want to make mobile network games, than single player games." Any time I get a chance to speak with mobile game developers or publishers in the West, I press them on mobile multiplayer. How soon? Why not yet? Kim was saying that the Korean mobile market has finally matured to the point where multiplayer gaming is to be expected. Why this change? What factors lined up to permit mobile multiplayer? According to Kim, rapid uptake of new devices has certainly helped: "The main thing is the phone. The phone type is upgraded. These days there are many good phones. In Korea many people want to buy only new phones. If you buy today [a particular] phone, in a week or two, it will be an old phone." These new phones have better graphics and sound, and especially larger memory - helpful for permitting larger games. It gives me hope. In another year or two, when the high-speed, color screens and SDIO-compatible mobile devices and smartphones reach enough critical mass in the West, carriers and developers will start the shift towards multiplayer games. Not too long after that, people may look back on the era of single player gaming on the mobile network as only a brief, anti-social interlude. And then we can begin to see the development of expansive play, beyond parlor games and into unending entertainments that use your location and your buddy list. "The Fantasy of the Forever Game" I called it in August 2000. Justin Hall is still recuperating from his travels to Asia in the fall. When he feels almost completely rested up, he'll leave for another part of the world and probably get sick again. And then he'll likely write about it on his web site Links.net, which turned 10 years old today. Huzzah! Thanks to Joanne Kim for her late night Korea telephone assistance.